These handsome, white, one inch puff-balls are often tinged with pink or lavender -- especially as they age -- and can form mounds a foot or more across. The one-third inch, oval, sage green leaves grow vertically and are easily recognized even when the flowers are not present. Altogether this is an unusual and easily remembered plant. 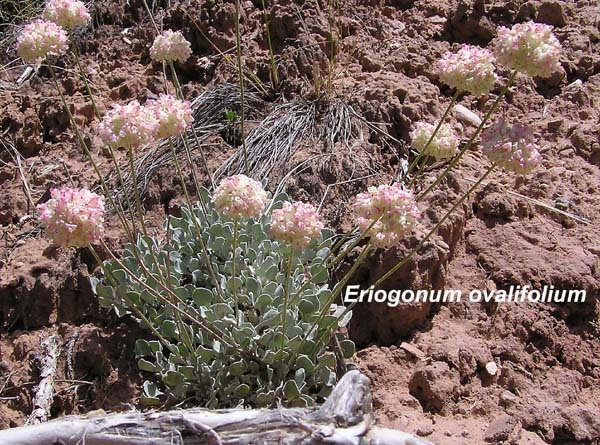 The 2005 Flora of North America, v. 5, recognizes eleven varieties of Eriogonum ovalifolium; three of them occur in at least one of the Four Corners states. The Flora says that "E. ovalifolium is a highly diverse and widespread complex of generally distinct but sometimes intergrading varieties". E. ovalifolium occurs in all of the Four Corners states. The Eriogonum genus was named by Andre Michaux (1746-1803) in his 1803, Flora Boreali-Americana. "Erio" is Greek for "wool" and "gono" for "knee", referring to the woolly leaves and swollen joints of the type species. Thomas Nuttall named this species in 1834. "Ovalifolium" refers to the leaf shape.